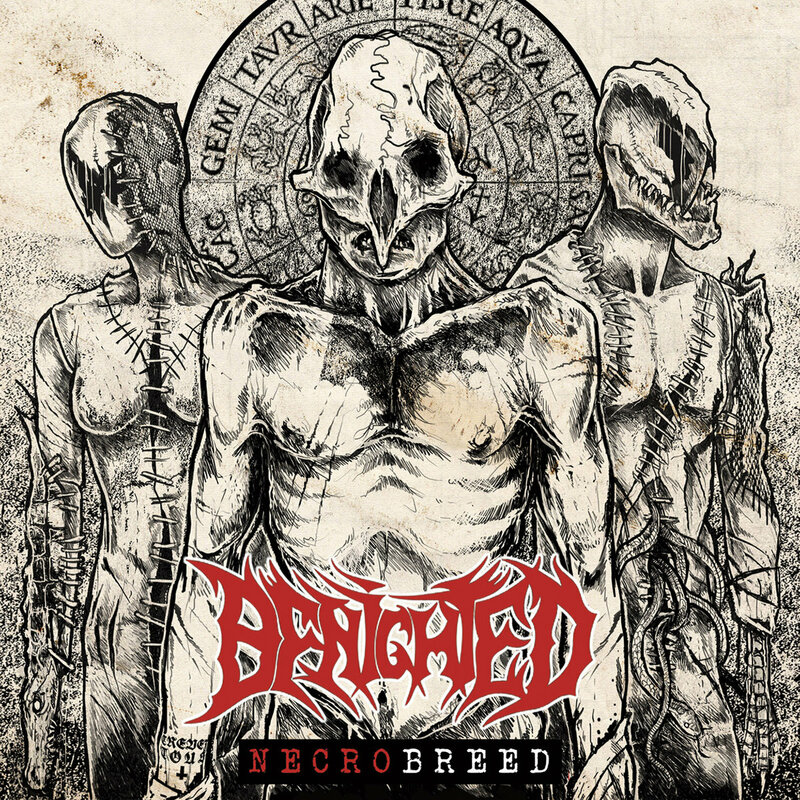 The Sludgelord: ALBUM REVIEW: Benighted - "Necrobreed"
ALBUM REVIEW: Benighted - "Necrobreed"
Benighted are the equivalent of a gargantuan, hyperactive monstrosity, hybridizing the manic-spastic energy of a joyous slasher rampage with the gurgling insanity of some cthonic abomination. It's taking me a while to put this review to bed. 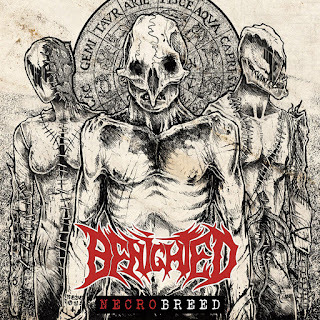 This is because Benighted, particularly with this bloody album, are the equivalent of a gargantuan, hyperactive monstrosity, hybridizing the manic-spastic energy of a joyous slasher rampage with the gurgling insanity of some cthonic abomination. This is my turgid, long-winded way of saying that it is nearly impossible to sit still long enough to write a review about this album while listening to this album. I will confess: as a long-time devotee of Osmose Productions, I was mildly nervous when Benighted made the jump to Season of Mist. Now on their third album on SoM, it actually feels like a pretty good fit despite some reservations I have about the wider roster. Everything about “Necrobreed” feels over-the-top in the best way possible; the pure adrenaline exuded by every track lets it outpace “Carnivore Sublime” in every relevant category. In the FFOs mode, I found in this album whatever intangible element seemed to be missing in Anaal Nathrakh's otherwise excellent “Whole of the Law...” it just comes together slightly better and has the feeling of a cliffhanger at almost every juncture, complete with jump scares and moments of sheer terror. If pushed to identify highlights, I would nominate the aggro-fest of “Psychosilencer” and the terrifyingly crusty title track. “Mass Grave” also makes for an exceptional album closer. Energetic, fun, shrieking, guttural, pulverising, perversely ecstatic. Proof that deathgrind still has a sense of levity and enjoyment in the music it produces. Apologies to the band that it took so long to get this out - but it is a compliment, ultimately...I was too busy enjoying your music and the ensuing tachycardia to write about it. ALBUM REVIEW: Palmer - "Surrounding The Void"
ALBUM REVIEW: Rozamov - "This Mortal Road"
ALBUM REVIEW: Rezn - "Let It Burn"
ALBUM REVIEW: Radiant Knife - "Radiant Knife"
ALBUM REVIEW: Arduini / Balich - "Dawn of Ages"
ALBUM REVIEW: Let It Die - "The Liar & The Saint"
ALBUM REVIEW: Ides - "Born To Run in Place"
ALBUM REVIEW: Black Star Riders - "Heavy Fire"
ALBUM REVIEW: Mountain God - "Bread Solstice"
ALBUM REVIEW: Pallbearer - "Heartless"
ALBUM REVIEW: Allochiria - "Throes"
ALBUM REVIEW: Accept - "Restless and Live"
REVIEW: Deadwound - "Identity Shapes"
ALBUM REVIEW: Evil Triplet - "Otherworld"
ALBUM REVIEW: Obituary - "Obituary"
ALBUM REVIEW: Power Trip - "Nightmare Logic"
ALBUM REVIEW: Hey Satan! - "Hey Satan!" ALBUM REVIEW: Telepathy - "Tempest"
ALBUM REVIEW: Dopelord - "Children of the Haze"
ALBUM REVIEW: Fen - "Winter"